Discover a world of flavour. Deliciously dressed in garlic. We love them with grilled peppers. Ready to eat hot or cold.Garlic King Prawns Firm and Succulent Prawns Ready to Eat When we discovered these prawns they got us very excited! Not only are they as garlicky as gambas should be, theyare also ready to eat! Simply put them in the microwave or enjoy them cold. Try with grilled peppers. (Cat D - 800W 1 min).Before cooking: Remove sleeve. Place on a non-metallic plate.After cooking:Check food is piping hot. Allow to stand for 1 minute. For best results do not pierce film. For microwaves with different wattages, adjust the heating time accordingly. Before cooking: Remove all packaging. Heat a little oil in a frying pan or wok. 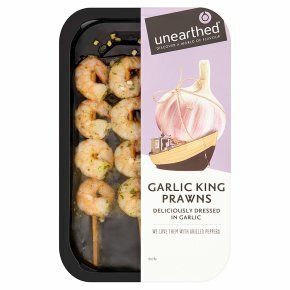 Once oil is hot add the prawn skewers with sauce.During cooking: Pan fry on a moderate heat for one minute on each side.After cooking: Check food is piping hot. Do not reheat once cooled. All cooking appliances vary. This is a guide only.